On April 21st,�we reported that�AKB48's sister group�SNH48, which is based in Shanghai, would start gearing up for promotions. Now Japanese media have officially reported this new addition to the '48 franchise. The surprising�announcement�about�SNH48 was made�during 'AKB48 Shanghai Fan Meeting'.�Including domestic sister groups, it will be 6th AKB48 sister group and the 3rd non-Japanese sister group, JKT48 from Jakarta Indonesia and TPE48 (scheduled to debut in this summer) from Taipei, Taiwan being the others. Akimoto Yasushi is in charge of producing SNH48. Auditions for the group's members is scheduled to begin this fall. Every girl who can commute to Shanghai may apply.�The debut date has been�tentatively�set for December 8th, which is�AKB48's�7th anniversary. 'AKB48 Shanghai Fan Meeting' took a place at Shanghai Mart on April 21st. This marked the group's�3rd fan meeting in Shanghai. Kojima Haruna, Abe Maria, Natori Wakana, Kawaei Rina and Suzuki Shihori made appearances and�performed�"Aitakatta"�and 'Heavy Rotation'. 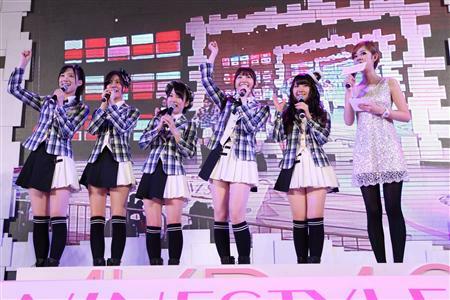 When the surprise announcement of SNH48 showed on the stage screen, more than 2,000 fans broke into loud cheers. Kojima and other members weren't previously informed of this announcement, they also seemed just as surprised as the fans. Kojima stated "We weren't informed about this, so we are very surprised. I'm happy that we will have younger sisters in Shanghai as well. I wish I will have more chances to come and go between Japan and China." According to reports, there are plans to set up SNH48's own theater in Shanghai. �They are currently in the process of selecting a possible site for the theater. Korean singer Se7en releases full PV for upcoming single "Love Again"